This card is for the A Blog Named Hero Clean and Simple Challenge. A huge slice of birthday cake for Hero Arts 45th Anniversary! Hero Arts started making stamps in 1974 and is still going strong today. Did you know that all of Hero Arts stamps are made at their factory in California and that the company has put many green practices in place? All of that, and great stamps! For my post today I wanted to wish them a Happy Birthday/Anniversary with this modification of the layering cake stamp set inspired by some of those amazing rainbow cakes we all see on Instagram. I used the Color Layering Birthday set and the Snarky Mix and Match Messages for the Sentiment. I really like the bold simple font and it has some funny second lines that go with it. To start the design I stamped it out on scrap paper to see if I would be able to realistically layer all the rainbow colors. Then I took an 8.5×11 piece of Dove white and Pebble Hero Arts Cardstock and cut off 4 inches so that when I folded it in half it would be 3.5 inches wide by 8.5 tall, your scrap can be a card layer for another card. I inked up the cake portion of the stamp two colors at a time with my mini-ink cubes from MMH kits, so red on the bottom portion and orange on the top, then the next two colors and the next, stamping two by two all the way to the top. You can use any inks you have in ROYBGIV ( red, orange, yellow, green, blue, indigo and violet) order. I wanted 8 layers so have two purples. I then used Versamark to add the white embossing powder to the frosting area and heat set it till it was smooth for the lower layers I used my Versamark pen to draw in the rest of the frosting lines between the colors and on the side of the cake. Then fussy cut it out after stamping the candle on top. I wanted a clean look with the cake really emphasizing the tall card so used the Happy Birthday and gold embossed that and the sparkles behind the candle directly on the card base. I gold heat embossed the candle too but afterward made it three dimensional with some liquid pearls in gold and orange. I added the cake with some foam behind it and added a soft Copic shadow underneath it. I love that you can make all your favorite flavors of cake and frosting and don’t have to stop at just two layers with this set. If you have any questions just ask. Supplies listed below as usual. Enjoy! Hello Everyone, I LOVE Valentines and have to make a lot of them so I needed a design that was easy to mass produce but could be customized so each one would be unique. My YouTube followers know more about my process when I want to mass produce cards because I show how I start with an idea or technique and then make lots of parts to mix and match that go together in unique ways. Making a quantity of each design element and then getting to mix and match them not only speeds up your time to make a lot of cards but is also a doorway to your own creativity. So let’s get started! As you can see I cut down all of the cardstock into 2-3/4″ squares so you can get 4 cards from each 8.5×11″ sheet of cardstock in the kit. I made 12 mini cards from the red, magenta, pink from the kit and some Neenah #110 pound white cardstock from my stash. The most important part of this design for me was that when you get the kit you get a small selection of the patterned papers from Pebbles, not the entire pad, and all of the pads always come with a coordinating paper strip where it is perforated into the top. These pairs are always the perfect combinations and usually what the designer liked when putting them together so I wanted to use them up! Building the central strips from the tops of the paper also allowed me to use the larger pieces for the coordinating enveloped, a big win! In the Video I show you how I did this and used my WeRMemoryKeepers mini envelope maker to make the matching envelopes, so easy and quick! I also simply cut out all of the small messages and little signs from the other two pieces of paper in my kit and added a silver embossed edge to make them really special little embellishments for the front of the cards. I stamped and embossed the small heart border and XOXO border in red or pink ink or embossed it on the front as well. Once you have made all your little parts it is really fun to mix and match your embellishments while you are assembling. You can even go a step further and add some shimmer pen, jewel drops over some stamped or additional small hearts or add some jewels, pearls or sequin bling. You can watch the video here or on my YT channel here to learn a little more about how I made the strips and embellishments for my cards, I hope you find this inspiring and that you can make some of your own to give to all of your sweeties! As always supplies are listed below, some affiliate links are used at no additional cost to you. Thank you for supporting me and the blog. Happy Valentines Day! Hello and Happy Summer, I have been away for the last two months and I am so sorry! I went to Simon Says Stamp Create and had an amazing time but came home to a boatload of work and a month of Birthdays and a card sale! I made some really fun masculine Birthday cards that I will post soon, and just did not have time for the May SSS kit at all. But I spent all last weekend working on this group that used that beautiful bouquet stamp to create an opposite end layout that can either create a frame for patterned paper or your sentiment or hide a layer of vellum used over the patterned paper to soften it a bit. I used embossing to capture the watercolor and did some white pencil shading and a few other techniques to make a bunch of very different cards from a single stamped design. Check out all the cards you can make and get some inspiration in the video or over on YT! You could use the same design on any color cardstock and simply add a sentiment for a SUPER simple quick card. 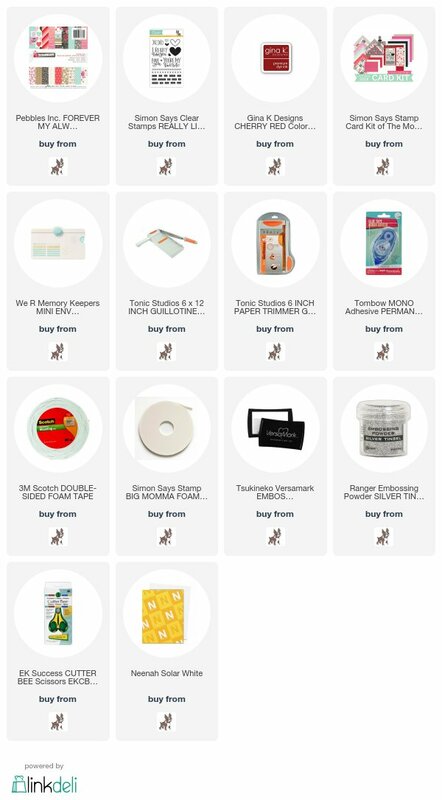 Supplies are listed below because the kit is sold out but all you really need is the stamp set and supplies from your stash. I promise to be back soon. Summer is here and there will be more time to make some pretty things. Simon Says Stamp January 2017 Card Kits Cards & More! Happy New Year everyone, I know that I missed a month in the hustle and bustle of X-mas but wanted to jump back in with a set of cards from the Simon Says Stamp January card kit as well as a new feature that I am going to try to do every month. Due to the explosion of people making cards with the kit and consequently they sell out so I have decided to still showcase a project from the kit but with the main focus being the stamp set. I also am announcing a surprise new monthly project that will be a tag of the month from the kit for the next 12 months culminating in a pretty way to bind them up and keep them as a keepsake! The post for January’s tag is here as well as more information on sharing your tags with me, check it out! So for this months kit I wanted to provide one background pattern design that could be stamped on different colors and types of paper but used in completely different ways to create 5 different cards. I created a layout with the stamps in the Misti to start and then stamped that pattern on Neenah Solar white, white, dessert storm, SSS Audrey Blue, from my stash and the cornflower blue cardstock from the kit. I used Ranger Blue Yonder Dye ink and the new Simon Says Stamp Barely Blue as well as Audrey Blue on the Audrey Blue paper. I also white heat embossed with SSS Fine detail embossing powder (more detail on this in the video. It has some positive points for detail but there are some tips for using it as it is very fine) on distress cardstock, and the Cornflower blue and the beautiful vellums in the kit . I used Evergreen Bough, Mermaid Lagoon and Broken China for this Distress Ink Blend. I also used holographic embossing powder on the vellum and on a white scalloped panel, but ALL with the same pattern. This was so easy and saved so much time! I used the new Tonic Nuvo Jewel drops to make my own water droplets and love how they compliment the snowflakes. I did use one extra stamp for the cute puppy that I bought before X-mas and didn’t use and I thought he was perfect for the cards, but you could add any critter you like and just color their accessories to match, Copic colors I used were C5 and C3 for the Grey in the Pup and for the Blue Scarf B93 and B95 for the Teal scarf BG23 and BG34. The ground under the Teal pup is B000. Hey everyone, Happy New Year! I have a new Paper Hear Scissors Monthly Feature. It seems like as the popularity of the Simon Says Stamp Monthly Kits has grown people have been making alot of great sample cards and I wanted to mix it up a bit as well as inspire each of you to participate with me more so I am going to try out something new. Each month when I get the kit I am going to make a tag and save them up for 2017! I have created a link up gallery page here for you to share your tags monthly and win a prize! Please subscribe to my YT channel for the latest video and the blog here to share your tags. At the end of the year we will create a project that brings them all together for a wonderful keepsake. I hope you will join me! So excited to meet more of you and see what you are making. Hello,Happy Fall! I have really gotten into fall cards this year and when I got this months Simon Says Stamp Card kit I immediately wanted to challenge myself with the big sentiment, but in a new way. I knew that I could do a lovely emboss resist with watercolor but I really wanted to try out the Delicata ink and do one of my favorite techniques with the embossing folder, which is creating the metallic paper that I then embossed and used to die cut the small leaves out of. In my usual fashion, I made a bunch of things to use before I worked out all of the designs. I used an inked embossing folder, made embossed and inked vellum and homemade metallic paper and created an ombre stamped sentiment. For the inked embossing folders, you ink inside of the folders by simply adding ink to the raised areas by rubbing or pressing on one of the raised sides with your ink pad or you can use a brayer. This is neat because it presses the ink into the cardstock and almost looks like a letterpress design. For the colored vellum you emboss first and then rub the ink over the vellum and then rub it in with either a mini ink blending tool or a clarity stencil brush. You can also simply blend ink into the embossed card on top for another look. I show all of these in the below video on YouTube. I hope you got some great ideas from seeing how you can use large sentiments and your embossing folders to create some very different styles of cards. I pulled Nuvo drops in copper, hero arts crystals and some metal domed embellishments from my stash and of course added some sprinkles of paint. I hope this encourages you to try the 5 cards from one set challenge with yourself too. Mae sure to share your success with me! Video below and on my YT channel here! I don’t know about you but I have ALWAYS loved to scratch something off to reveal what is below it. Starting with Cracker Jacks and trivia questions to lottery tickets, it is always exciting to see what is below. So, I was delighted to get the inky antics scratch off stickers in this kit and my mind went a thousand different directions on what could be done with them and all of the cute sentiments. Anyhow I did two designs for you all with one being only items from the kit save for a different balloon shape from last September’s kit and if you did not have that then you could use just the ones in this set, the second design uses the bicycle from the Beautiful ride set from Simon’s Spring release. The first design as above, can be used to mass produce even more cards and you can extend this to include different patterned papers in your stash as well as changing up the ink colors to be all in one family or match the season. Even if you use up all the supplies or the kit is sold out you can get the stamps and use whatever you have in your stash to make this cute and easy card with a surprise. The second card invites you to use your imagination to take a look at other stamps in your collection and think about how balloons could fit in there, outside of the bicycle, I was thinking a park bench, bird or other critter or a wagon could easily be holding the balloons. The above bicycle card also shows how you can easily vary the amount of coloring you do to create very different cards. You can watch the video here as usual and matching ink colors and supplies are listed below. If you have any questions please leave a comment. Hello everyone! I saw that there was a call for designers for the Concord and Ninth Design team and since I LOVE LOVE LOVE their stamps I thought I should enter and use some of the stamps in a new way. I had been waiting to get the tree ring background because it was sold out for the longest and so it was the perfect time to design a card that used the adorable Birdie Banners and Alphabits and the script word “loved from the You are Enough set. Let’s get started! First I stamped the word loved and the banner outlines on a Simon Says stamp piece of fog card stock, then the birdies and cut masks for both of these so that I could clear emboss on top of them and have them look like they were in front of the tree ring. I made a quick video for you all to see how I put it together with a few tricks thrown in to ease the way, you can see that here or in HD on my YouTube Channel here.